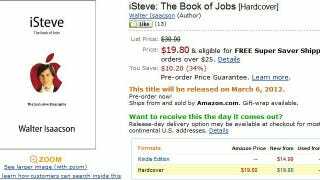 Amazon is now taking pre-orders for the Walter Isaacson-penned Steve Jobs biography, iSteve: The Book of Jobs, slated for release March 2012. Along with the listing is what might be the final cover and price for the tome. WWDC 2011 Predictions | Here comes iCloud, but what else?